As David Lloyd, MCing Techcon at the Radio Festival again this year mentions, it’s been a quiet weekend in the media. The first session was about studio design, and Tim Lowther from Global talked us through the rebuild of Capital’s studios in London. They employed people who previously had designed and built TV studios to build them. BDA ended up building both Capital and Heart’s studio space in Leicester Square. He mentioned that they learnt from the Capital build and put more sound absorbing elements into the Heart building. They also used a substance – corian – to build the studio desks rather than the generic plywood/MDF that you’ll find in most studios. There are now 16 LCDs per studio at Global! They’ve also got a very nice camera solution for vision mixing several remote Panasonic cameras and later mixing the studio audio in a streamlined manner. We got a nice preview of a proposed Classic FM studio much along the same lines as the Capital and Heart studios. Sometime within the months seems to be the plan. Then it was NIck Sheridan from “Global” News – at the BBC. Yes – it confused a few of us for a moment. They’ve been building glass studios, which is a fairly challenging idea with lots of environmental challenges. In particular it had to be a flat pack design that would fit in a regular office space. It needed to be appropriate to speech radio. The key thing about a glass studio is that they cannot be square. The back wall is absorbant and the side walls are on a 10 degree angle. Having built some studios in Bush House back in 2005/6, they then had to spec out the news studios for New Broadcasting House and in particular 28 studios were needed. There, they went to four sided glass boxes with “baffles” hanging from the ceiling to mop up noise. It’s fascinating that you can get a glass box to make good sound. Funnily enough, as Sheridan mentioned, having got the walls right, we then fill studios with monitors. Next up was Geoff Woolf talking about project ViLoR. He showed us some truly ancient looking desks in some local BBC radio stations. This was a project about employing cloud computing to serve BBC Local services. The main issue surrounding use of the cloud is minimising latency. With radio that’s very important – think of having a mobile phone conversation with someone on the radio. You can end up talking over the other person. The key finding was that the presenter needs to be able to hear their own voice in real time with no delay. If that can be achieved, then you can actually have up to 200ms delay without the service sounding poor to the listener. Essentially you centralise the “apps rooms” or server centres in a couple of locations and put all the key hardware there. In reality, probably a couple of locations for resilience. That simplifies things locally. The plan is that by the end of 2013 four stations will have been moved over to ViLoR, with a further three stations in 2014, and the remainder being completed by the end of 2017. Amazingly just 4 servers can handle all the audio editing and archiving for all 38 stations. They’re trying not to use the term “data centre” for their radio centres. All of this means that station costs are reduced substantially and the time on site is massively reduced. The Technical Innovation Award is handed out each year at Techcon. First up was Anthony Abbott from Absolute Radio presenting what the station has done with InStream. Ben Matthew will talking in more detail about this shortly. Listeners get fewer and more relevant ads, while advertiser get more targeted ads – something they’ve demanded since the internet is now offering it to such a great deal. Research has shown the InStream users are more aware of brands, and are better engaged with the brands. Coming next will be utilising the RadioPlayer interface to allow logged in listening, and then the Xbox app which is also due to launch soon. Ken Phillips from the BBC talked to us about the BBC’s Proteus system that allows users to avoid the use of the term “metadata” amongst users, but allow programme makers to share the same data in lots of places. In the past there were lots of paper based systems, and the same information might be reported and rekeyed in lots of different places. Music reporting is a good example of that. Phillips talked through how some of the data can actually be crowd sourced, and things like live versions are trivial amends to the pre-recorded versions. This is all gathered by using unique identifiers for each programme. And if a change is required for a rebroadcast, then the administration required is minimal. We’re told that this has all gone down enormously well within the BBC! 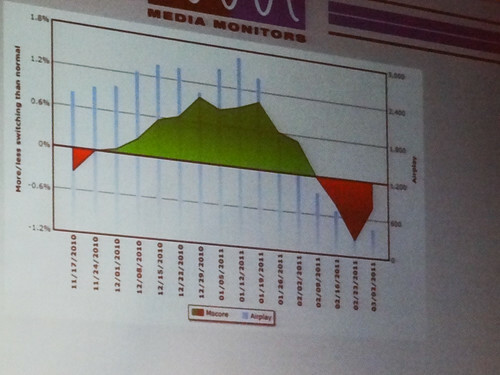 One of the key issues was presenting a nice user interface to make it easier for data to be entered into the system. The next step is to open the system up to independent production companies, and let them and the BBC save time and money. At the moment, the system is at programme level, but they’re looking at moving down to item level. Then linking the audio assets with the metadata within Proteus is another development. Some of this data can then be made publicly available. In the end, there will be an API to let others access the data. Ben Matthew from Absolute Radio and Bruno Nieuwenhuys from AdSwizz are next, to explain how Absolute Radio has been building its InStream product to personalise radio. Ben explained that it’s not just about ad replacement but could also mean replacement news or traffic and travel bulletins to localise them. It could even replace songs. Ben took us on a whistlestop tour through what actually happens in an internet audio stream through one of many different possible systems. He also talked about the considerations that are required in setting up such a solution and the work required to do this. Then Bruno talked us through the reasons why you might want to do this kind of thing, and the various ways you could integrate this type of solution into your streaming process. He explained why AdSwizz chose the solution they did and some of the challenges they faced as they “spliced” the internet stream and to embed the advert that you’re replacing at the right time in the right place. Then Ben went into more detail about how we needed to reformat Absolute Radio’s audio to facilitate all this. And he went into some of the challenges for keeping streamers in sync as much as possible and the various options and solutions available. A key consideration is your listeners no longer being live. Tony Churnside from BBC R&D was next up to talk about some location aware drama that they produced. He began by explaining that different people hear their sound in different ways, and it’s not necessarily in the way that producers intended. Different people are hearing their audio in different ways depending on their speaker set-up at home. A simple example is BBC coverage of the Proms. There’s a stereo set-up for radio, and 5.1 set-up for HD television. The BBC is now thinking about sound in an object based approach. That has flexibility beyond a channel based approach that’s been used in the past. The system you’d use to listen to the audio would be able to determine what the optimal playback would be for your listening experience. Tony demonstrated an audio drama called Breaking Out (I mentioned this the other day) that took information from the internet and turned into audio on the user’s own PC. Furthermore, you can actually generate radio subtitles as part of the process. A future idea might be a documentary that goes into more detail if you’re interested in a particular type of information. Another project that they’ve been working on is recording an orchestra with several microphones and then letting the user determine what they might hear in different parts of the hall. The individual sound elements are adjusted at the client level. Finally we saw a video that tried to let users “conduct” an orchestra themselves. They used an Xbox Kinect to facilitate this. The morning session was completed with a video about BBC ViLoR – this time as one of the shortlisted Technical Innovation Award nominees. 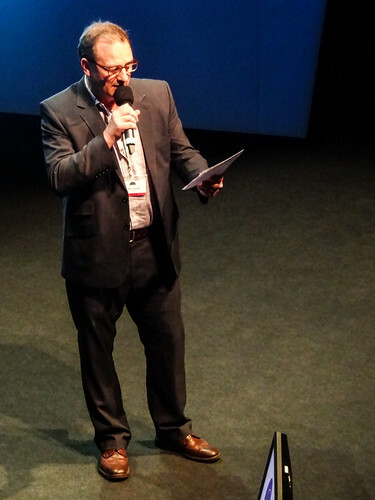 After the lunch break on day one, the main festival kicked off, with Clive Dickens introducing the session. Tim Davie was originally scheduled to speak, but obviously he has other things on his plate. Bob Shennan from Radio 2 and 6 Music filled the breach. That said, I was still up in the Techcon room and missed this session. Speakers from Arqiva then took us through the issues surrounding IP delivery. Nathan Dixon talked about the various technologies that are out there including the fact that some older systems are being phased out. He ran through the various issues and considerations in choosing an appropriate form of technology to deal with IP delivery. 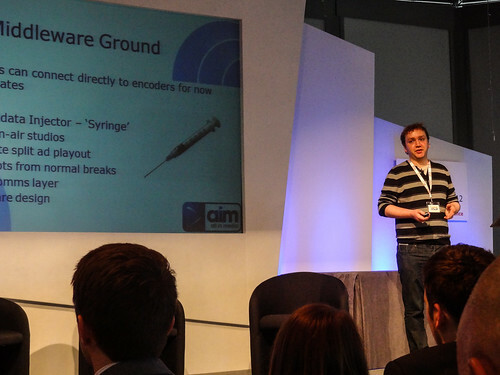 Peter Willison then spoke about the advantages that IP has over other technologies for delivering audio to sites. Disaster Recovery is one obvious case with IP allowing you to quickly get an audio feed back up and running – assuming you have enough bandwidth. Ian Prowse and Hugo Scott Whittle from Vortex were next up to talk about the various technical solutions that can be used for an outside broadcast. Ian began with a quick run through of the history of various technologies that we’ve had to use historically like the telephone system. He moved on to ISDN from the early nineties – technology which, as he mentioned, is still used in football statia today. IP codecs available today using 3G to provide the connectivity can provide some significantly good quality. There is also now VoIP with things like Skype, which really isn’t at all bad. Hugo then went into a bit more detail about IP, first pointing out that the packet nature of it doesn’t have quite the same guarantees that a guaranteed line had. He then detailed the pros and cons of some of the applicable technologies. One interesting thing that Hugo mentioned was that business contract SIM cards are much more robust in usage than consumer ones! Finally Andy Sutton from EE came on to talk about 4G and how it’s somewhat different to 3G in terms of working. The key taking from his session is that Quality of Service (QoS) is built into 4G/LTE, and that it’s fundamentally IP packet based. It has an entirely different architecture to previous mobile telephony products. Richard Earle from the BBC talked about why they took an IP route to deliver streams back to base using IP rather than other broadcast architectures for covering Radio 1’s Hackney Weekend. In total they had 7 live streams including Radio 1, 1Xtra, BBC London and BBC 3, red button and BBC HD on television. 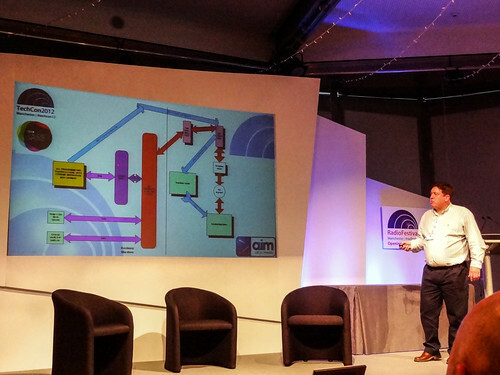 ISDN was an initial solution but it needed too many lines, and was cost prohibitive. Similarly satellite cost a lot and introduced delays. So they looked at using the BBC’s architecture already in place for the Olympics on a neighbouring site. They used an optical link to get the signal from Hackney to the BBC’s Olympic site. Richard ran through the various issues they faced and they had overcome including issues surrounding weather, interference caused by people testing other kit locally in advance of the Olympics. A damaged fibre link was only fixed four hours before the first transmission. The BBC is now beginning to use this methodology for more programmes including Any Questions on Radio 4 and the 1Xtra Live Tour. Sam Bonham of DRUK, Nick Piggott of Global Radio and Mark Sutcliffe of Arqiva were next up to talk about the issues surrounding DAB in car. I only managed to catch the first half of this session. Sam explained the Digital Radio Action Plan background, and in particular what needs to be in place to “earn” a digital switchover. He talked about the minimum specification behind a digital “tickmark” to point consumers to good quality products. As yet, the tickmark isn’t in place, but once it is, it’ll be placed on relevant devices in a similar way to the digital TV equivalent mark. The criteria that need to be met include FM, DAB, DAB+. It must have service label display, and a number of other criteria. Service following and traffic announcements are two key criteria that have recently been tested, and this session now went on to talk about. There are two types of linking – hard linking and soft linking. But this isn’t something that consumers consider. They just want to be able to continue to listen to their favourite station. One challenge was making service following work using just a single tuner. Dual tuners can make things work more easily. Then there are political considerations – for example linking Classic FM and Capital, or even Heart and Capital. These are things that car manufacturers, for example, are concerned about. An ETSI document prohibits abuse and determines how service following should work correctly. 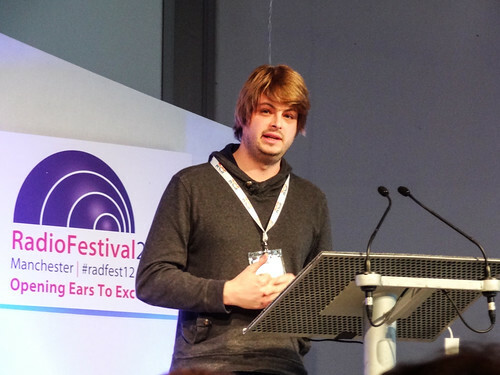 In the main festival room, Chris Maples from Spotify was next up in a session subtitled Friend or Foe? I notice that he entitled his presentation Disrupt or be Disrupted. 4000 years of music was apparently streamed last week. I’m not entirely clear how, but I guess you could divide up those cumulative hours into three minute tracks. He began by noting how more important music is in our lives. In his world he says that they have brands, consumers (not “listeners”) and artists. Spotify, he said, comes from a place to help the record industry. Music piracy was at its height when Spotify was invented. Sweden, for example, is young, digitally adept and tech savvy with fast broadband. He says piracy has been reduced by over 35% since Spotify was created. Young consumers want their services now, and they want it on every device they have available to them. As well as Spotify, he drew an analogy with Xbox and Windows Mobile. Between 2004 and 2010, global music revenue fell 31%, largely driven by piracy. 2010 was the time when digital music revenue overtook physical music sales. That will never go back, said Maples. Physical will plateau at some point. Maples took us through a Spotify timeline, including the importance of syncing Spotify together with your iTunes library. 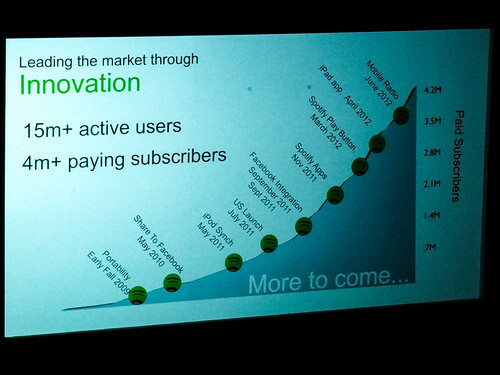 Facebook integration in September 2011, was another important landmark and caused Spotify to grow substantially again. 0.3 second is the time between you hitting play and the music starting on Spotify. For some people, “having a blank canvas of over 18m songs can be a bit overwhelming,” so they needed something to hold your hand and take your through those songs. They have to iterate and keep developing because someone else could come along at any minute says Maples. And he says that they have to work out how to put their service into connected TVs. Interestingly, creating Spotify giftcards is as much marketing as getting people to actually pay for the premium service. To launch a service in the US, get Justin Bieber to tweet about you! That delivered more impact than any other media they used to launch the service. He said that they will continue to iterate, grow and re-energise their business. They’re “paranoid” about it. They have a slate of territories that they want to expand into. He says that they do work with some radio and TV stations. If they partner with the right services, he says that they can create better services. Aleks Krotoski wants to know if Spotify is encroaching onto radio. Maples said that if Spotify didn’t exist, others would be in that territory. Spotify works with radio groups, and it enhances the combined offering. When asked how a radio station can work with Spotify, Maples said that the best examples are perhaps putting curated playlists from DJs on Spotify as well as working with stations (Absolute Radio) with brands. But we’re still in the early days, and there’s a way to go. A foreshortened Q&A sadly did not get into when Spotify might start employing some named presenters. Back up in the Techcon room I caught the end of the final entry in Technical Innovation Award which detailed the work done for service following by Global Radio. Yes, I missed Bruce Daisley from Twitter, but he came into work recently and gave us a talk, so I thought it was safe to miss. Joe Harland came on to talk through radio visualisation, in particular from a perspective of Radio 1 and 1 Xtra. The real test, said Harland, of whether or not your visualised radio is any good, is whether someone has nicked it and put it on YouTube. – Do not put your cameras up high. You get security camera footage and don’t get a decent shot. – Nobody really knows what the best way of doing visualisation of radio is right now. But we can have a best guess, and that’s what Radio 1 is doing, embedding video as part of the production process. – Your studio does not need to look like the X-Factor. – You don’t need to be in vision the entire time, because it’s boring the entire time. – It must be all part of the radio producer’s workflow, and not hard work. Radio 1 has a neat switching system that lets the presenter either go into an automated system or the presenter to override everything and choose their shots. The pan-tilt-zoom Sony cameras that they have in studio at Radio 1 don’t look completely dissimilar to the Panasonic ones that Capital showed us this morning. But they also have some tiny little desk cameras at consumer quality. Harland said that the live feedback from visual radio elements can help you determine better than RAJAR what is working and what isn’t for your listeners. Visual, thinks Harland, is the way we can reach new listeners. The new system in the new Radio 1 studios goes live in two weeks time. Jim Ford from Mediacell then gave us a quick introduction to their electronic meter measurement solution. RAJAR has just announced that a trial is ongoing with the technology to provide additional insight into how people listen. Mediacell’s approach is to use an app on smartphones that listen to hidden signals in the audio. Currently they use audio watermarking, but have the ability to use audio matching technology. The technology allows you to begin to interrogate longer term trends in radio listening, and examine things like station loyalty. We’re only at the beginning of this process and ove rthe coming months there are plenty more things to learn. The data is derived from the Arbitron PPM. By examining the data in addition to music log files, you can begin to examine whether a particular song causes people to switch in or out of your station. His data shows that in the drives to and from work that most switching takes place. That’s because it’s easiest at those times to switch to a competitor’s station. But the peak percentage of switching is only 8% of listeners switching – it’s during evening drive. By looking at the data for a specific song over a longer period of time, you can see the lifecycle of a song, first being unpopular when it’s unknown, becoming more popular and then towards the end of its cycle becoming unpopular. And because it’s behavioural rather than response based, RCS believe it’s more accurate. In a sports context, he demonstrated an example of an American Football game where the peak comes after the game’s finished during the postgame. He also showed us the losing team’s hometown numbers where nobody wanted to hear the postgame show on radio after the team had lost.